We loved this recipe! 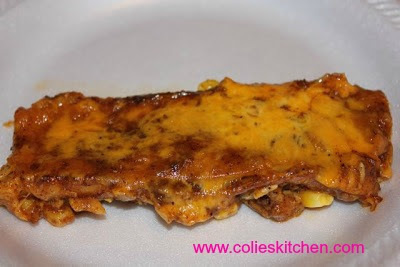 The corn in the enchiladas adds such a nice change to your “typical” enchilada recipe. One thing I will say is you are not expecting the corn yet the sweetness from the corn paired with the spiciness from the enchilada sauce is a nice combination. I have been dying to try this recipe for a long time, but for some reason I kept forgetting to make it. I am so happy I did and I can’t wait to make it again. It’s probably my new favorite enchilada recipe. It’s going to be hard for any other recipe to top this one. Delicious! Preheat oven to 350°F. Stack tortillas, wrap in foil and bake until softened, 8 to 10 minutes. While tortillas are baking, oil a 7-by-11-inch glass baking dish. Warm 1 Tbsp. oil in large skillet over medium-high heat. Add scallions and garlic, and cook until fragrant, about 1 minute. Stir in corn and milk and cook, stirring occasionally, until thickened, 7 to 10 minutes. Season with salt. Remove tortillas from foil. Set aside 1/2 cup cheese. Spoon a heaping tablespoon of corn mixture in center of a tortilla. Sprinkle with a heaping tablespoon of cheese. Roll up tortilla and set in dish, seam side down. Repeat with remaining tortillas, overlapping them slightly. Pour enchilada sauce over tortillas and sprinkle with reserved 1/2 cup cheese. Bake until bubbling, about 20 minutes.